Broken Bootlegs is a series covering unlicensed games (also known as bootleg games) for mainly 8-bit and 16-bit consoles. This week’s edition covers one of the Harry Potter games for the Mega Drive. First off, I want to say , to possibly my family’s shock and horror, I’ve really never had any exposure to Harry Potter whatsoever when I was growing up. Save for this exception, I have yet to read nor see the series to this day. 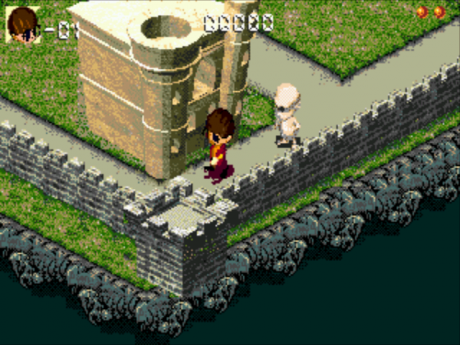 During my search of Mega Drive games more than a decade ago, I found a Harry Potter game, and thought to myself that this game might be a pirate or a bootleg. After starting up the game, I was greeted with the title Harry Potter und der Stein der Weisen, which made me think it was possibly a German release. Unfortunately, it was followed by a bunch of Cryllic text, so I honestly have no idea where this game came from. Off to a great start already, I delved into the game. The first thing that really stuck out for me is the higher-quality PCM music that was used for the game and levels. The music is something that was very usual with my experience in a larger part of Mega Drive games in general over the years, given how bad some of it’s games sound. From there, I tried moving Harry around in the level to figure out what to do. Almost immediately, I lost a life after running into an enemy. After quickly dying a few more times, I received a game over. I took short break, I tried playing again and realized that this game plays like an isometric Pac-Man. While the pre-rendered graphics on a Mega Drive don’t look terribly spectacular, they look somewhat decent with the given hardware. Levels are split into a couple of different sections, so it can take a bit of time to find all the dots to make it to the next level. The controls are a little stiff, so making turns and avoiding enemies can be a bit of a challenge at times. It it isn’t overtly difficult to get though the game’s three levels, though. While playing the second level, I noticed something slightly out of place in that that it had a little bit of graphics from Sonic 3D Blast in it. The third level that really stood out to me, though, and took the cake. Upon starting the level, it looked and sounded very out of place in comparison to the previous two levels. Not only is it an Arabian-themed level, but it even plays the music from Street Fighter 2’s theme in it! While all that is pretty neat, the game is only three levels. After completing those three levels, it’ll kick the player back to the title screen. There are a few other Harry Potter bootlegs out there that I might cover at a future time, but this one stands out from the rest as this isn’t a platformer. It’s a very short game that can give a bit of entertainment, but otherwise wouldn’t warrant a purchase. Conversely, if you’re looking to either try to complete your bootleg collection, or if you’re a huge Harry Potter fan, this would be a good addition to any library.